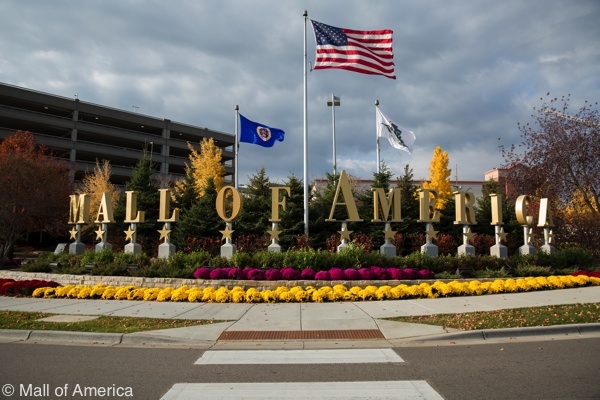 Much to contrary belief Mall of America is not in either sister city Minneapolis or Saint Paul. It is located about 1.5 miles from the Minneapolis–Saint Paul International Airport in the southern suburb of Bloomington. 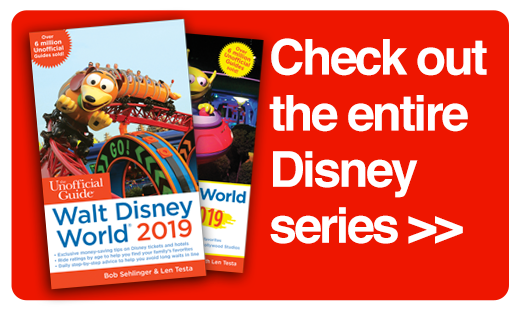 Similar to how Orlando gets credit for being home to Disney World—it’s actually located in Lake Buena Vista—Minneapolis frequently gets the glory of being home to the nation’s largest indoor shopping mall. 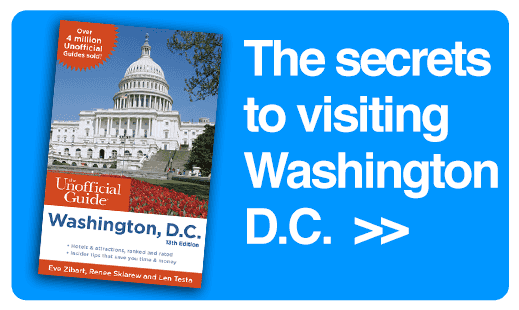 Naturally, the two Twin Cities and surrounding suburbs like to claim some kind of connections to the mall that draws all. 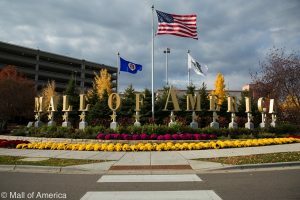 Hotels, restaurants, local water parks, and even tattoo parlors love being able to claim they are “only minutes from Mall of America.” It’s true; if you removed all traffic from the highways, getting from Bloomington to the epicenter of either downtown would take roughly 20–25 minutes. Traffic, weather, and construction make for a different story, however. On April 24, 1956, Metropolitan Stadium “the Met” opened in Bloomington and was home to several sports teams. 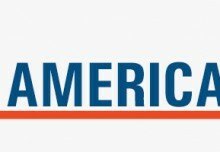 First came the Minneapolis Millers minor league baseball team (1956–1960), then the Minnesota Twins and the Minnesota Vikings played there from 1961 to 1981, while the North American Soccer League’s Minnesota Kicks shared the space from 1976 to 1981. In January 1982 the Twins and Vikings relocated to downtown Minneapolis’s Metrodome. After the move the Bloomington stadium sat vacant, occupying 78 acres, for several years until demolition began and was completed in 1985. The Bloomington Port Authority began tossing ideas in the air about what to do with this space. 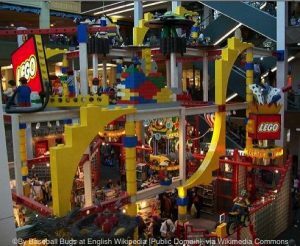 Location, location, location rang true with the site, considering it was only a mile and a half from the Minneapolis–Saint Paul Airport and it sat at the cross section of Interstate 494 and MN 77 (Cedar). The proposals boiled down to four ideal options: office complexes, multi-residential possibilities, a new convention and visitor center, or a retail and entertainment complex. You can probably guess which straw was drawn. 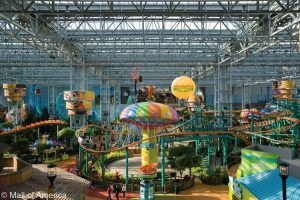 In 1986 the opportunistic Ghermezian brothers, the men behind the world’s largest retail and entertainment center that had recently opened (West Edmonton Mall in Alberta, Canada), signed an agreement with the Bloomington Port Authority to develop the United States’ largest retail and entertainment complex. Ground broke on June 14, 1989, with Ghermezian’s Triple Five Group leading the endeavor. It was a blustery day, with 35-mile-perhour winds, proving that this attraction was what Minnesota needed. Regardless, many cynics threw money on the table saying this enterprise would never take off, let alone succeed. 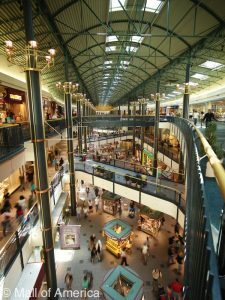 Slightly over two years later, on August 11, 1992, Mall of America was ofcially opened to the public. We weren’t there, but opening weekend looks like a success when you watch a video on YouTube entitled “Mall of America Opening Weekend 1992.” The video shows thousands of people lling the multilevel space, riding roller coasters, inline skating in the Rotunda, and creating with LEGOs. We notice that most of the stores in the video are long gone. Anchor stores included Bloomingdale’s, Macy’s, Nordstrom, and Sears and were included in the 330 new stores. The best part, 10,000 people were taking home paychecks. Since opening day, MOA has seen many stores and restaurants come and go, including original anchor Bloomingdale’s. MOA attracts a wide variety of offerings, including the dueling Apple and Microsoft stores situated directly across from each other in the South Court. In recent years one-year leases have been offered to retailers to “sample” MOA to see if the mall is a good t. Some retailers move on when the lease is up, while others have re-signed and stayed around. In 2015 the 750,000-square-foot Phase II rollout began, and while the unveiling was slow, the sparkle was bright. The new grandiose front entrance revealed a colorful new Mall of America star logo, the perfect photo op for visiting tourists. The new expansion included over 150,000 square feet of retail space. 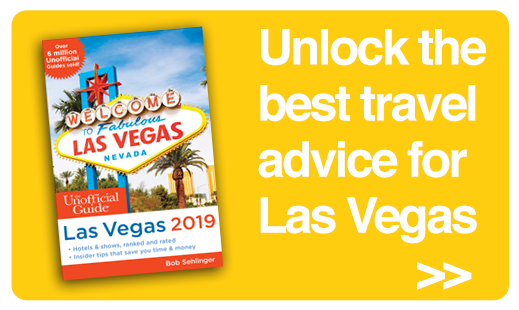 Of the new portion, Level 1 was designed to attract luxury tenants, Level 2 was reserved for home-inspired shops, and Level 3 welcomed Culinary on North, the new food court. JW Marriott opened in November 2015, followed by a stream of stores and then office buildings in spring 2016. Shopping is the tip of the iceberg when it comes to what draws people to MOA. Celebrities frequently show up for book signings, concerts, and other publicity appearances. 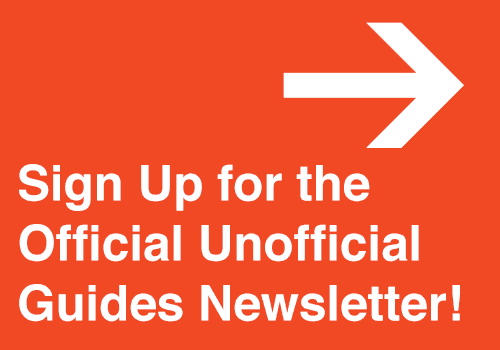 Holidays bring a bounty of festive events, while fund-raising walks are held year-round. What especially makes MOA outshine its counterparts across the country is its numerous big-traffic-driving attractions. 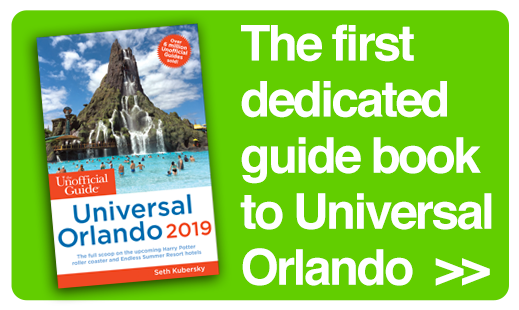 The most prominent by far is the 28-ride theme park, currently called Nickelodeon Universe. 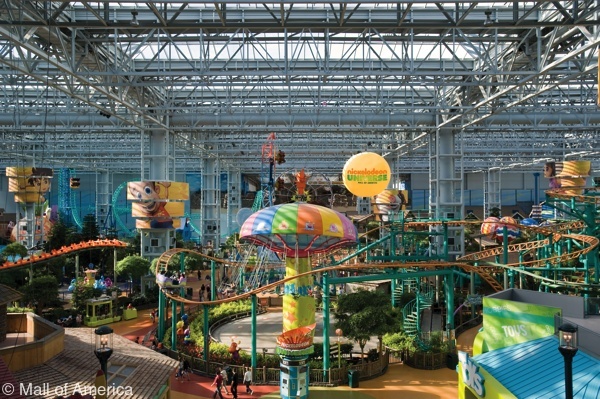 Other popular attractions include the 70,000-square-foot Sea Life Minnesota (formerly Underwater Adventures), 2,500-square-foot Amazing Mirror Maze, Theatres at Mall of America, and specialty stores such as LEGO, American Girl, the newly updated Build-A-Bear, and the brand new Crayola Experience. Ready for a visit? 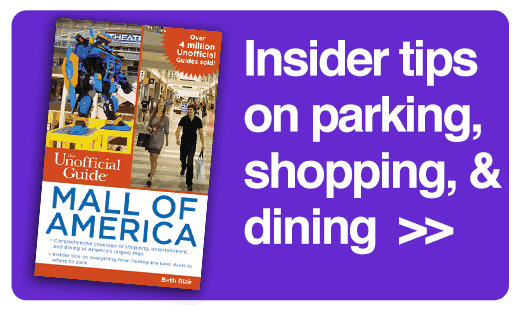 The Unofficial Guide to Mall of America by Beth Blair, offers insight and tips that will not only make the visit fun for those looking for a general Mall of America experience but will also highlight things for people with special interests.